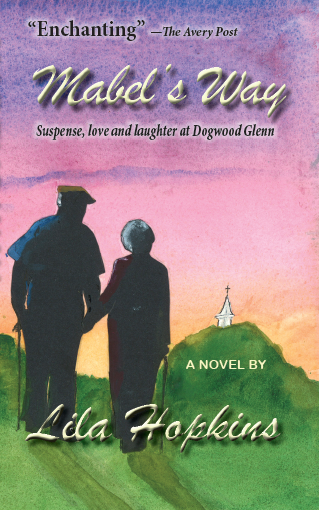 Cover art for Mable’s Way. An original work of art by the author. Among other things, she is instrumental in getting a newcomer to return to playing her baby grand piano and sharing it with another musician. She spends lots of time with Ruthie Sue, a woman who does not quite “have it all” – even to finding out who is persecuting her and scaring her at the swimming pool. She encourages a former opera star to plan a talent show, gets an artist to give art lessons, counsels a woman who was terrified of dying and helps rehabilitate a minister. She tends to be “bossy,” but her way is gentle enough that everyone loves her. Then enter Dr. Tucker Quick, a university administrator, who moves into the apartment across the hall from Mabel. She does not care for him at first because of his constant teasing. When she finds out he had known her first husband when they were in graduate school together, she begins to warm to him. She sees him in a different light after he protects her during a tornado. He quickly becomes an unwilling ally in Mabel’s adventures. Tucker is author of the book, The Code Breakers, and a superb cryptologist. He has long been a hero to Mabel’s son Ed and they hit it off amazingly well because of a shared interest in cryptology. Neither Mabel nor Tucker expect to fall in love, but they do. Then, Tucker simply disappears. While he is gone, everything goes wrong for Mabel. She falls and breaks her wrist, she descends into a deep depression and worries her daughter and friends to distraction. Tucker returns from a secret mission with an Army Reserve Unit just in time to save Mabel’s life. A vicious robber is holding her captive and threatening to throw her off the fourth floor balcony if she refuses to give him all her money. Because Mabel is a little impatient, she thinks she missed her opportunity to become Mrs. Tucker Quick, but Tucker is more persistent than Mabel gave him credit for. She gladly forgives him for going away and also for making her feel mighty stupid. Forgiving was Mabel’s way. Or Click Here to buy a signed copy. I have just ordered your new book “Mabel’s Way” as soon as I read about it in the INDEPENDENT. Mabel D. Council (Johnson) was my teacher in 8th grade Civics at FSHS and the coach of the basket-ball team that let me dress out and practice, (but did little playing). The last time I saw Mabel was at the 45th or 50th reunion of my class of 1948. She certainly played a memorable part in my adolescent years. Thanks for the book and its dedication. Hi, Lila – I enjoyed the synopsis. It brought back memories of having been involved in the proof-read. Fred…………. Nifty! And what a lovely photo of the author. Congratulations!